LUA HADAR with TWIST presents Like A Bridge: a 69-minute Live Studio Concert directed by Emmy-winner Lawrence Jordan, showcasing the band’s “cosmopolitan jazz” sound. Songs in seven languages weave the theme of our common humanity through this passionate, fun and eclectic performance by vocalist Lua Hadar and her band of top international musicians. We are happy to announce the September 2016 release of the full-length Like A Bridge Concert Film on iTunes and Google Play. To celebrate this event we are releasing a series of nine short episodes of the story behind Like A Bridge, entitled Building Bridges, at this link on Youtube. The Like A Bridge Collector’s Edition DVD is for sale at all live Lua Hadar with Twist shows. All About Jazz review of Like A Bridge, by Geannine Reid 10/25/12 … a bold, worldly musical venture… Hadar’s grasp of various languages and vernaculars is vast, singing in English, French, Spanish, Japanese, Portuguese, Italian and Malagasy. What is more impressive is her command of each of the seven dialects’ dictions and supple inflections within the musical selections, and her phrasing of each melodic line…a bridge of musical delight that makes a truly global journey, introducing sounds from across the beautiful palette of diversity. Footage from the World Premiere screening of our Live Studio Concert movie, Nov. 15, 2012, at the historic Balboa Theater in San Francisco. With special guests David Miotke on Jazz Accordion, Emil Miland on Cello, Fumiko Ozawa on Koto and Gideon Bendile with members of the Kalahari Experience Zulu Choir. 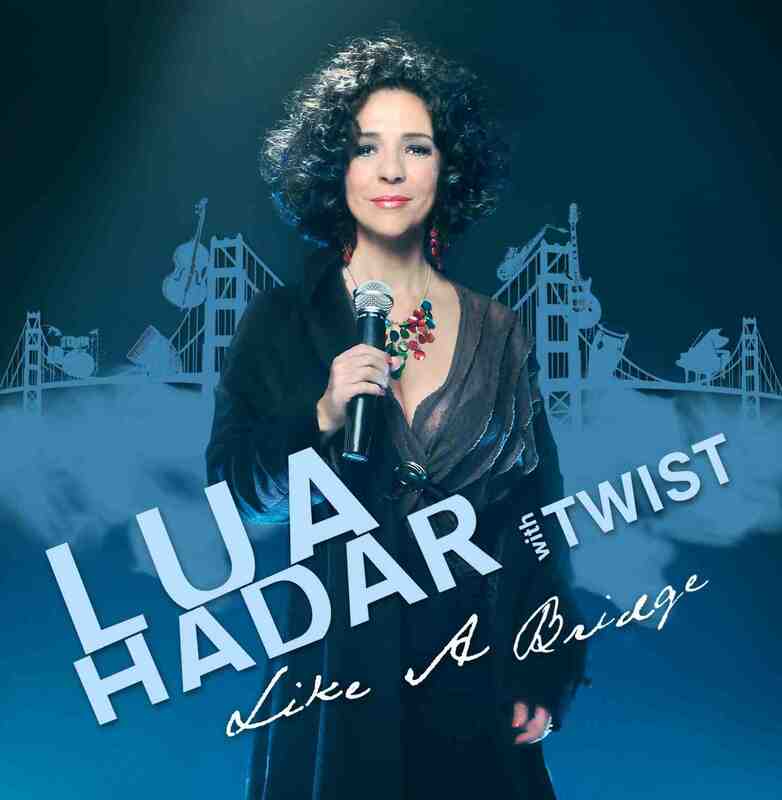 DESCRIPTION: LUA HADAR with TWIST: Like A Bridge (CD, DVD, Concert Film download) was recorded live at the legendary Fantasy Studios in Berkeley, California. Lua’s cosmopolitan jazz sound draws from many nationalities and styles, connected by our common humanity, with the Bridge as its symbol. Since its inception in 2007, Hadar’s world jazz band Twist has developed a reputation for twisting the style of international standards, performing original numbers and presenting songs in several languages. The new recording features songs in English, French, Italian, Spanish, Portuguese, Japanese and Malagasy, the language of Madagascar. The DVD includes a 69-minute Live Studio Concert directed by Emmy Award winner Lawrence Jordan (Tony Bennett, Sting, Mariah Carey, Eddie Izzard, more). The 9-part series, Building Bridges, about the making of Like A Bridge, has now released on Youtube. Instrumentation: vocals, piano, acoustic and electric bass, drums, global percussion (udu, cajon, dumbek, shakers), reeds, koto, cello, jazz accordion. Maxime Le Forestier’s pop song, “Born Somewhere,” advocates for immigration rights in both French and Zulu. The compelling, upbeat performance features Lua’s French vocal, backed by South African performer Gideon Bendile, with members of his Kalahari Experience Zulu Choir. 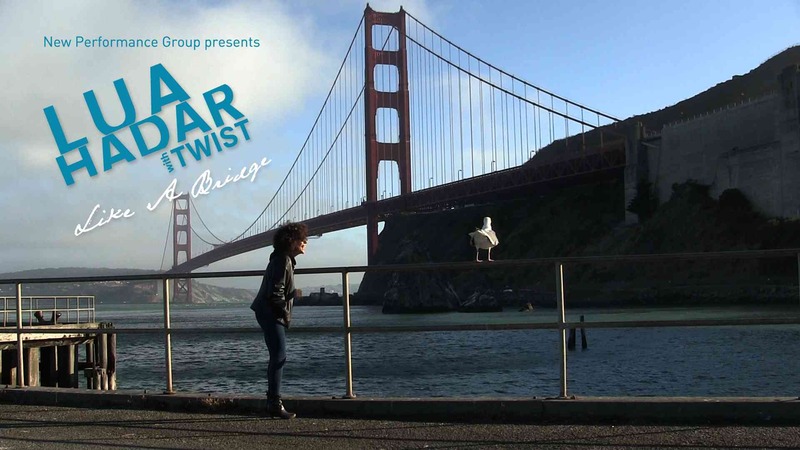 San Francisco Bay Area comedic songwriter Rita Abrams penned a few extra lyrics for the 75th anniversary of one of the world’s most iconic bridges. Lua enjoys the romp as she takes on the persona of the Bridge who’s been through it all. Mystic, visionary, virtuoso, and composer, Alexander Scriabin dedicated his life to creating musical works to open the portals of the spiritual world. Music Director Jason Martineau takes the lead in a unique virtuoso jazz adaptation of the 1894 piano work, with fiery performances by bassist Dan Feiszli and drummer Celso Alberti. This American pop classic has been embraced by the world and beautifully expresses how all human beings can reach out to each other; person to person, country to country, culture to culture. Larry De La Cruz solos on alto sax, adding to the rich warmth of Lua’s vocal in this world beat rendition. “If only it would rain coffee.” Lua sings this exuberant anthem of the 99% from the Dominican Republic, backed up by the driving force of Celso Alberti on the drum set, Ian Dogole on cajon, with Larry De La Cruz wailing on tenor sax. A folk classic from the island of Madagascar, the former French colony off the east coast of Africa. Sung by Lua in the original Malagasy language and twisted as a samba, the lyrics ask, encouragingly, “If there is still a smile and time to share happiness, why waste your winter nights crying, hungry for the light?” Larry De La Cruz solos on flute. “Ue o Muite Aruko” made its debut on the world pop stage in 1963, known then as “Sukiyaki.” A song of dignity and hope, it was notably reprised after the 2011 earthquake and tsunami in Japan, encouraging the devastated populace to “walk with its head up.” Music Director Jason Martineau collaborated with koto player Fumiko Ozawa to create a new east-west arrangement of the pop classic, sung by Lua in Japanese. A mystical waltz in Portuguese by Antonio Carlos Jobim and Chico Buarque, its wide vocal range is usually covered with a male-female duet. Lua’s duet is with renowned cellist Emil Miland, evoking the oneness of man and woman in the cosmos. Martineau’s arrangement pairs the love theme from Fellini’s “La Strada” and its palpitating Italian lyrics with the world famous Ravel’s “Bolero.” Hadar sings with passionate intensity: “You say you do not know how to love, you say you cannot love; but you are bewitched by love!” Celso Alberti on the snare drum with Larry De La Cruz on the classic soprano sax theme. The Far East Suite (1966) was inspired by a world tour undertaken by cultural ambassador Duke Ellington and his orchestra in 1963.The Khaju Bridge in Isfahan, Iran, is regarded as one of the most beautiful bridges in the world. Twist’s arrangement of Strayhorn’s “Isfahan” features Jason Martineau on piano, Dan Feiszli on bass, Larry De La Cruz on alto and Celso Alberti on drums. Like A Bridge DVD debuts November 15, 2012. 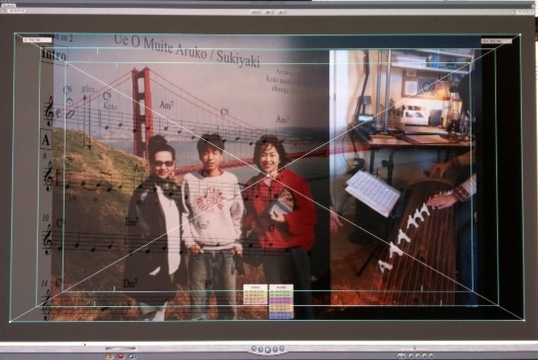 A shot from the edit room; working on the section of the video about our Japanese song, Ue O Muite Aruko, and the story behind it. Listen to the latest album! July 12 at 8pm - One Night Only - Twist Celebrates Bastille Day with our French music hall show, C'est Magnifique! Lua was a guest on KCSM's Desert Island Jazz on March 8 with Alisa Clancy. Click On the Air in the Menu bar on this website to hear the entire program. A dozen influential divas sing in several languages. Lua Hadar with Twist appears live with Guest Star 14-year old singer-songwriter Josh Reinier on Feb.16 in Oakland. See Press Release for all the info and ticket buy link. Like A Bridge Live Studio Concert DVD was given its premiere screening November 15, 2012 at the Balboa Theater in San Francisco. The CD is for sale on iTunes and Amazon, and is receiving airplay from Maine to Alaska, and as far as Brazil.